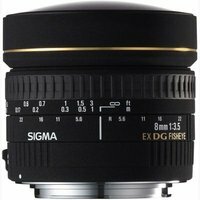 The Sigma 8mm f/3.5 EX DG is a spherical fisheye lens that easily captures a full 180° view in all directions, in a circular image. Even the most familiar and mundane of subjects can be portrayed with startlingly fresh new expressions through exaggerated perspectives and unusual distortion effects. Well suited for academic and technical measurements such as solid angle measurements, cloud cover measurements & virtual reality. Note!Full circle can only be captured with 35mm format digital SLR and film SLR cameras.